Every NFC tag you touch is saved as a new sticky note to your phone! Write back to the tag by simply touching the red flag of each note. NFC corkboard combines reading and writing with the elegant metaphor of sticky notes appearing on a corkboard. 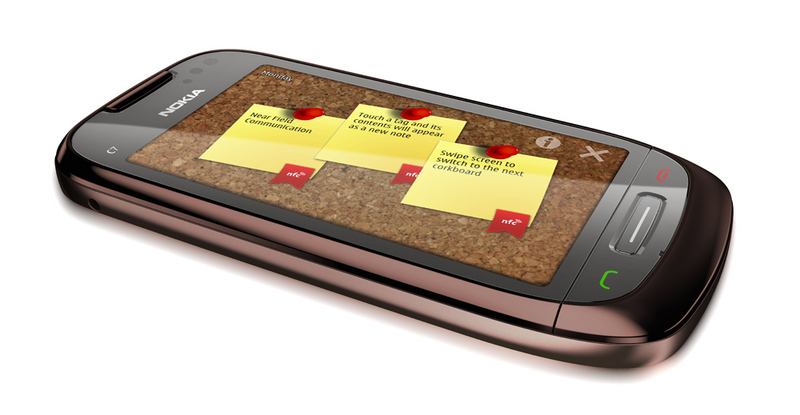 Through swipe gestures, you can switch between different corkboards – you have one per day of the week. Every time you touch a tag, the contents of its NDEF message are parsed and appear as a new note on the current corkboard. You can freely move the notes around, edit their contents or drag them to the trash bin. To write the contents of a sticky note to another tag, simply touch the small red flag and touch the tag. The app will inform you when the tag has been successfully written! With NFC corkboard, you can read tags that contain Smart Posters, URLs, Text or business cards. Additionally, it can write the first three formats – the corresponding message type is chosen automatically. To create a Smart Poster, simply enter the URL, then a line feed and in the next line the title. If you touch a tag with the external RTD urn:nfc:ext:nokia.com:nfccorkboard, the application is automatically launched on the phone. You can also write an autostart tag directly from the app – just explore the default notes on the different corkboards for more information! For full control over the tag writing process and to read all details from tags, check out Nfc Interactor. NFC corkboard is open source and based on the Corkboards example of the Qt SDK. It adds NFC reading & writing support, and fully optimizes the app for mobile phones. If you are interested in developing your own NFC app, take a look at the “NFC Development” slides hosted at Slideshare or at Nokia Developer. They contain a detailed step-by-step guide on how you can add NFC support to the Corkboards example. NFC corkboard is open source and can be downloaded for free from the Nokia Store for Symbian and MeeGo Harmattan. The source code is available at GitHub.